Of course, no reference to Jeremy Bentham would be complete without mentioning that his badly preserved corpse is still on display at University College, London. Bentham did not attend UCL but became affiliated with it in his later years. One of his students became UCL's first Professor of Jurisprudence (Bentham had passed the bar himself, though he never practiced). When he died in 1832, he bequeathed himself to posterity in his will, and let's hope he also left somebody some cash or else there were probably some long faces at that particular will-reading ceremony. My body I give to my dear friend Doctor Southwood Smith to be disposed of in a manner hereinafter mentioned…. The skeleton he will cause to be put together in such a manner as that the whole figure may be seated in a chair usually occupied by me when living, in the attitude in which I am sitting when engaged in thought…. I direct that the body thus prepared shall be transferred to my executor. He will cause the skeleton to be clad in one of the suits of black occasionally worn by me. The body so clothed, together with the chair and the staff in the my later years bourne by me, he will take charge of and for containing the whole apparatus he will cause to be prepared an appropriate box or case…. If it should so happen that my personal friends and other disciples should be disposed to meet together on some day or days of the year for the purpose of commemorating the founder of the greatest happiness system of morals and legislation my executor will from time to time cause to be conveyed to the room in which they meet the said box or case with the contents therein to be stationed in such part of the room as to the assembled company shall seem meet. By "the greatest happiness system of morals and legislation" he meant the theory of Utilitarianism, for which Bentham is best known today (other than maybe the Panopticon and the fact that his badly preserved corpse is still on display). The idea was that we should adopt policies that try to maximize the overall happiness of the greatest number of people possible, which does not entirely square with his decision to try to guilt his friends into hanging out with his preserved corpse every so often. But it's not a bad theory of justice, and to be fair, Bentham did have lots of great ideas, it's just that the Panopticon and having his corpse put on display are not among them. As you can see, he didn't actually leave himself to the university, but rather to his dear friend Dr. Smith and then to the executor of his estate, both of whom must have been overjoyed. But they did comply. According to UCL's website, Bentham and his case were moved there in 1850. Supposedly (and this is a story I was once creeped out by when reading Ripley's Believe It or Not! ), he is wheeled out to attend each meeting of the College Council, and is recorded in the minutes as "present but not voting." According to another story, he is used to break tie votes by being considered a vote in favor of any motion. UCL does not confirm or deny these stories, and so they are probably not true, but they are amusing in a creepy way. More amusing and more creepy are the facts surrounding Bentham's preserved head. According to another UCL webpage, titled "Bentham's Preserved Head," Bentham intended that his head would "be preserved by a process of dessication as practiced by New Zealand Maoris." Okay then—that was done, but apparently not by Maoris, because the head "deteriorated rapidly" and was replaced by one made from wax. This is the one he's wearing in the box (see above), and yes, that is his own dessicated head there on the floor. That is an old picture, however, because the original head is no longer there. The reason: students kept stealing it. The picture must predate 1975, because that's the year that Bentham's head was moved to a more secure location after being kidnapped by students from King's College London. The headnappers demanded £100 for its return; UCL says it finally agreed to pay but only after haggling it down to £10. Anyway, after the "ransom incident of 1975," the head was moved to the university's Records Department, and in 2005 it was given what seems a more appropriate home in the Conservation Safe of the Institute of Archaeology. You can still go see it, if you can demonstrate "exceptional circumstances." It's much easier to see Bentham himself (so to speak), because UCL has thoughtfully provided this virtual 360-degree rotatable image of him, which spins around once, hilariously, as soon as it loads. You can also spin him around with your mouse, which I suggest you do while listening to the theme from The Benny Hill Show for maximum effect. If this seems disrespectful, maybe it shouldn't. 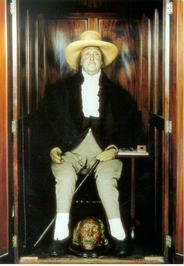 There is at least some speculation that Bentham intended the bequest as a practical joke to begin with. But even if he didn't, I like to think he'd be glad that, even if it does involve spinning his virtual corpse around, via the internet he is still able to contribute to maximizing the happiness of the greatest number of people possible.